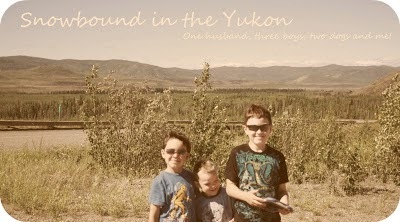 Snowbound in the Yukon: Starting again! It's funny how I want to blog and still don't blog. I've had plenty to say the last few months but just didn't have the desire to write anything. But I think about it a lot. I think about many things though and nothing ever gets put down on paper or put into action. I find my time is still pretty occupied by everyday menial chores. I keep saying when this gets done or that gets done then I'll take time for myself but it never happens. I have a hard time putting myself first and not because I don't want to, I really do but I am busy and unorganized. I'm used to being at the top of my game not the bottom. I feel overwhelmed and find myself in a tizzy somedays. Like many I have my good days and my bad days. Usually there are more good than bad and lately I've had in between days, neither good nor bad just days. I feel like I'm a just living, just getting by, just doing what needs to be done and nothing else. I've decided that I want to change this and I will. Who would have thought that once fall came I'd be busier, even though I have one child at school. Mickey starts his speech work this week, I'm starting an exercise class tonight, 2 nights a week. I feel like if I have a busier schedule I'll get more things done, so we will see. I'm once again going to have a slow start to a new exercise routine and get back to it. I've been say it for months but it's been 18 months since I found out I was pregnant and frankly I have to get back to it. I miss how I felt, strong and alive and positive. I'm tired of feeling tired and having achey kneeds. It's time, the time is now. So I weighed in this morning at 280lb. My goal is for next April to be 200lb. I also went and bought new runners today and feel like it will help. So I will concentrate on eating better and getting more cardio in this week as well as the resistance classes starting tonight. I have more to write but I'll be back at a later time.